Especially for a very complicated and detailed subject. I myself used Shutterfly to print 30 x 20 matte prints then cut them in half for 15 x 20 and sized my work any way I wanted. I then laminated them for durability and left a big enough border to have holes drilled in order to use binder rings to connect them into columns...Hung them using S hooks with the top rings. Small enough to pack in a larger suitcase and just the right weight to check if maybe half of an 8x10 booth. Not sure if bigger because of the weight of the laminate. Wow, Joan! Another very informative post. I was just talking about banners for Surtex with a friend who will be there this year. Aside from all that you posted here, we were trying to figure out what the best strategy is for choosing what artwork to put on the banners. My first thought was to put the best stuff up to draw them in but then we thought maybe it is better to use stuff that is great but not the best so that when they are in the booth looking, you have something left to WOW them with. Also there is a little fear that it would be easy for people to take pictures & plagiarize the art on the banners. Thanks Rachel for your comment. Sounds like a good system you have. I got vinyl banners for the Atlanta Gift Show this year from Vistaprint.com. They were less expensive than others I looked into and they were good quality. THANK YOU for posting this. What great info. I've been kinda stressing over how to print for the show and this helps put my mind at ease, sort of. This is an excellent post! For a number of years I mounted images on foamcore and took those big sheets to the licensing show. They were heavy, cumbersome, and never quite stuck to the walls correctly, even with Velcro. And they tended to warp in humidity. My worst experience with foamcore was when for some reason the weight of the boards overcame the stickiness of the Velcro, which wasn't sticking very well at all. The worst moment was when I was meeting with a very important licensee and behind the person's shoulder I could see, almost in slow motion, one of my boards ever-so-slowly separating from and eventually toppling off the wall onto the floor. Awful. Later that afternoon I went around to every art booth at the show and finally found the same solution that Joan recommends here - printed vinyl banners. I located a local printer in New Hampshire who could lay out the artwork and then print them off in the space of a week or so, and they worked perfectly, just as Joan describes. I haven't gone back to anything that requires sticking stuff on the walls of the booth and have no plans to ever switch from printed banners. My banners have round grommets in each corner, and I use the S-hooks provided for free at Javits in NYC (generally found at Freeman's service desk). As a result, my set-up is done in less than half an hour, and that's without rushing it. I re-use the banners from year to year if an artist hasn't created sufficient knock 'em dead artwork over the previous year, and print new ones for bright and compelling new art and/or artists. Now that I'm no longer within driving distance from New York, I FedEx the rolled-up banners in a tube from here to my hotel, and bring along an already-filled-out FedEx waybill that I can stick on the tube at the end of the show. Then I walk it down to the FedEx counter at the show, drop it off, and it's done. I've also taken to shipping my binders that way as well, and believe me, it's a relief to have it all work out so easily. Being based in the UK, price-wise, even with shipping and tax, it was still my best option. Thanks again Joan for a useful guide. Thank you SO much for sharing this info! This will be my first time exhibiting at Surtex and I've been stressing about printing banners- this post was extremely helpful and gives me plenty of options! Joan, really helpful post. I clicked through from Genevieve's link on her blog (thanks Genevieve). I am also exhibiting for first time and appreciate the variety of creative options for booth design -- too many ways to count, but banners seem to be the best solution on the back end. When you are at the show, the last thing you want is to spend four or more hours setting up your booth. That is very unpleasant- so to have this option if you can find good printer, is priceless for peace of mind. Great Post! I like your advice with regards to vinyl banner. Thanks Joan, more power to your blog! I know this post is almost six years old, but it is interesting to see how high the pricing was as well as the concerns with peeling and chipping. 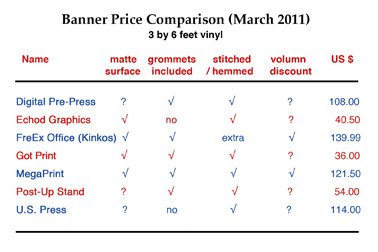 In a relatively short time vinyl banners have seen a considerable decrease in pricing. This combined with High resolution digital printing, vinyl banners are now an extremely cost effective way for promotion.